For media and other non-Internet electronic documents include the medium designator. Give the year of publication as it appears on the screen, face, case, or in accompanying documentation. The extent, location, physical description, and notes are optional. Life science animations [CD-ROM]. c2002. Dubuque (IO): McGraw-Hill Companies. 1 CD-ROM: color, 4 3/4 in. Hawkins RJ, Pearl MJ, editors. c2002. The athlete's shoulder [DVD]. Rosemont (IL): American Academy of Orthopaedic Surgeons; 1 DVD: sound, color, 4 3/4 in. Bates B. c1995. Abdomen [videocassette]. 3rd ed. Blanchard-Healy, Inc., producer. Philadelphia (PA): Lippincott. 1 videocassette: sound, color, 1/2 in. In the previous examples the secondary author (producer) and the descriptive notes that follow the publisher are optional; however, this information does provide clarity to a reader. 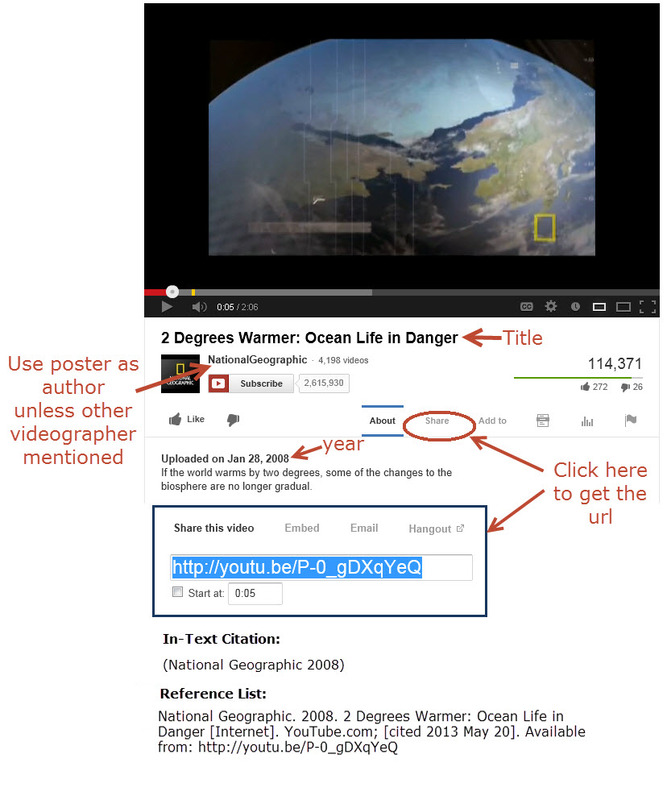 The general format and example below refers to an YouTube or other online video clip. Be sure to include the medium designator [Internet] after the title, as well as the date cited.